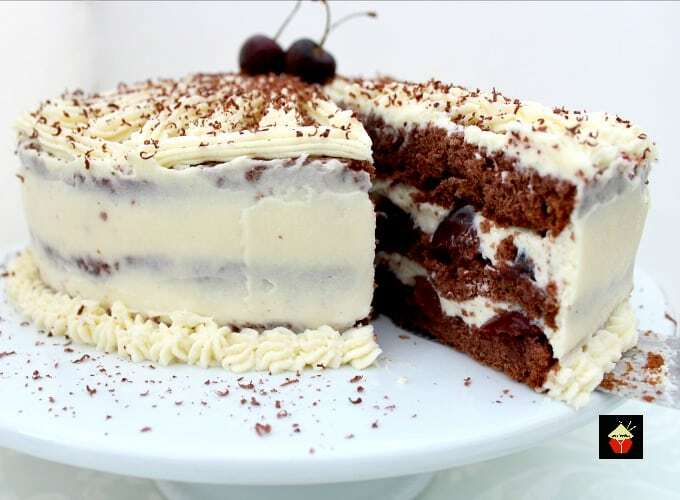 Authentic German Black Forest Cake, Schwarzwalder Kirschtorte is a delicious cake famous in Germany. 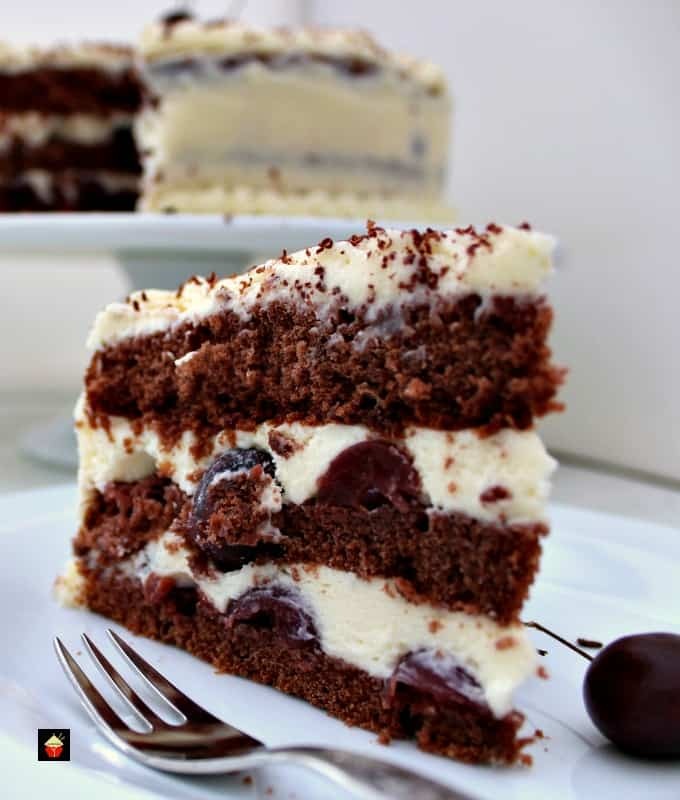 Layers of chocolate cake, black cherries and kirsch. Perfect for a party! 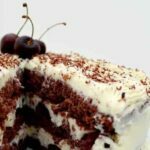 Authentic German Black Forest Cake or Schwarzwalder Kirschtorte is a wonderful cake! I spent many years living in the Netherlands, along the border of Germany and we would do our shopping across the German border, groceries, dining, in various nearby towns and cities. 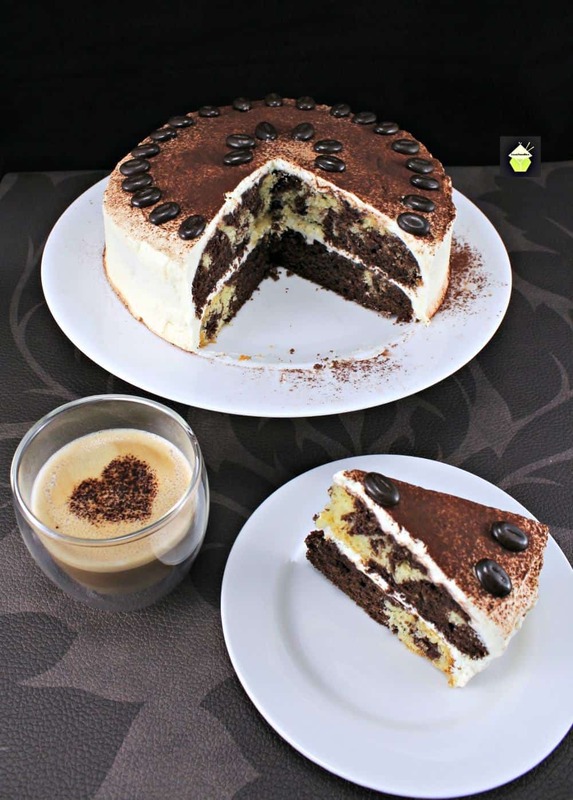 Often, we would call in at a cafe and enjoy a slice of German Black Forest Cake, or as it was described on the menu, Schwarzwalder Kirschtorte with a lovely cup of freshly brewed coffee. This cake is so very popular in Germany, it’s found in most bakeries, restaurants and coffee shops. The supermarkets often sell them whole in the fresh cake counter, and they’re huge! I suspect the locals would often buy such a cake for a celebration, like a birthday or an anniversary. It’s certainly a cake that would be fit for any celebration! Whilst living in Holland, I made friends with a lady who was originally from Germany, but settled in Holland. Inga was a fine baker and would often make cakes and various desserts (usually all with apples!) so I asked her if she would make a real, as in AUTHENTIC German Black Forest Cake for me and if I could watch her making it in her kitchen. So now we have a wonderful authentic Schwarzwalder Kirschtorte recipe to share with you, and oh my goodness! It really does taste exactly like the slices I had eaten so many times in the coffee shops in Germany. 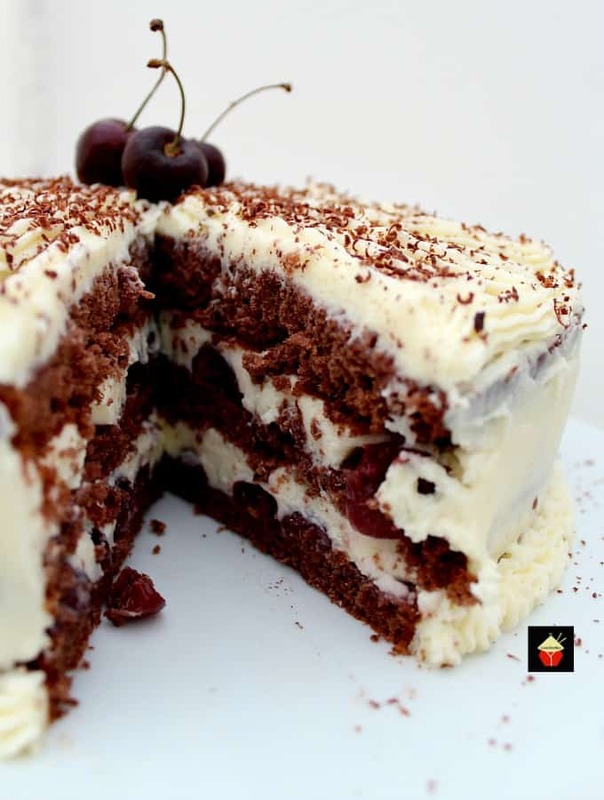 The texture of the cake is extremely light and packed with the famous cherry liqueur, Kirsch. 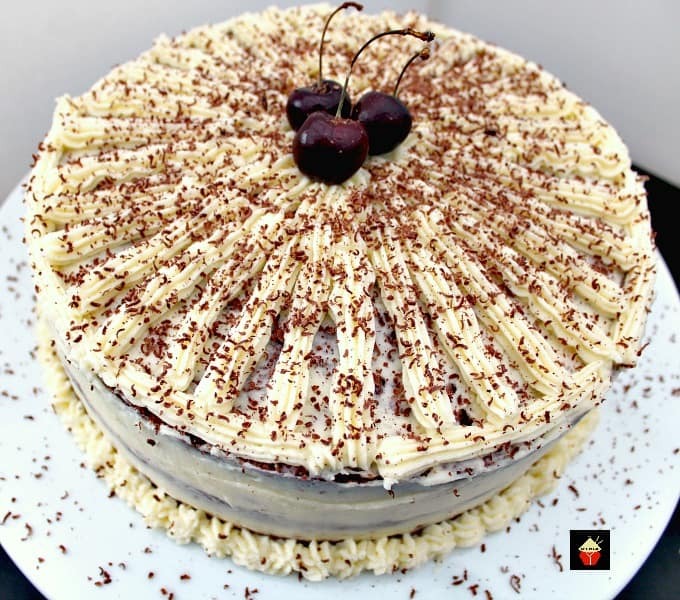 The filling is loaded with juicy kirsch infused cherries and freshly whipped cream, so in every bite, you get a lovely burst of deliciousness! Whilst Inga was showing me her recipe, she stressed you must use the jar or canned cherries which are in their own juice. 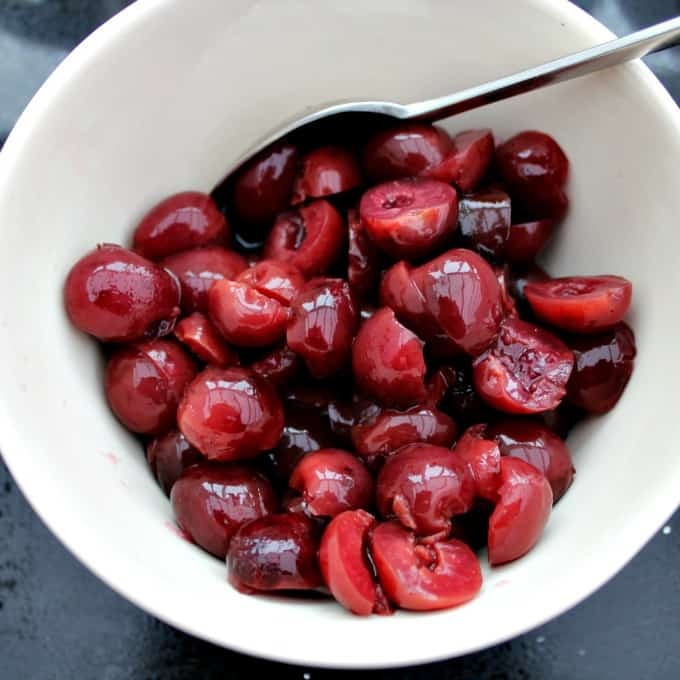 Fresh cherries just don’t work well, unless you soak them for the longest time to soften them and get them juicy enough. I stuck to Inga’s rule and simply bought a few fresh cherries for the decoration on top. 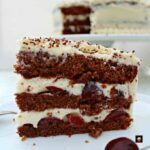 This recipe for German Black Forest Cake does take a little time because you need to make the cherry syrup, sponge, and filling, but oh my goodness! It is worth all the effort. As you will see, I kept the decoration of the frosting very simple and rustic looking. Inga had done hers like that and wasn’t overly fancy. Of course, if you want to, you can put your piping skills to the limit and make elaborate piping patterns and so on. For the chocolate on the top, I simply grated some over. You could be more elaborate and make chocolate shavings or shards and have them standing upright on the top of the cake. It’s entirely up to you how simple or elaborate you want to decorate. The kirsch liqueur is what defines this cake like no other, so I would not recommend you leave that out of the recipe. You do need to taste the alcohol, so yes, it is an adult cake! 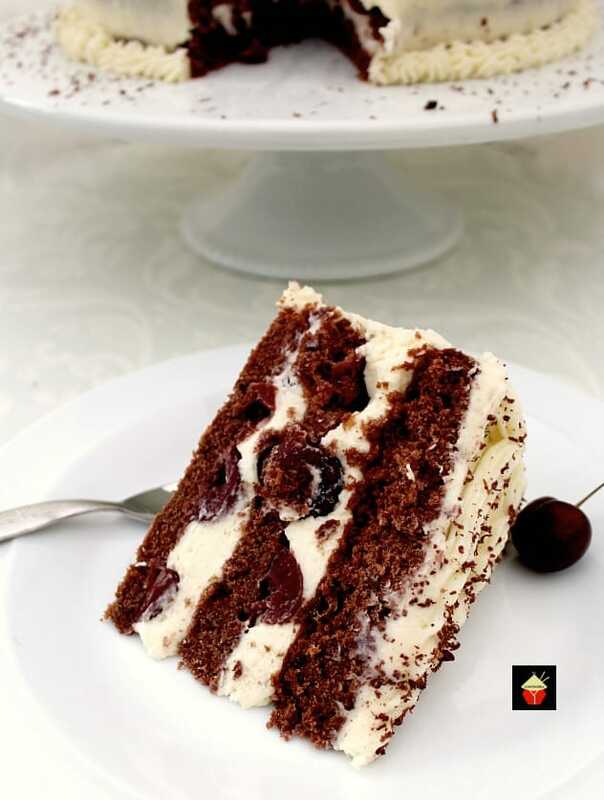 Without the Kirsch, it simply wouldn’t be an authentic German Black Forest Cake. So a huge thank you to Inga for allowing me to watch her make this beautiful cake and for sharing her family recipe with me. Let’s get straight to the recipe and please do enjoy as much as I have! 1. Make the cake: Preheat oven to 350 F, 180 C.
2. Grease and flour a deep 9 inch round baking pan. 3. 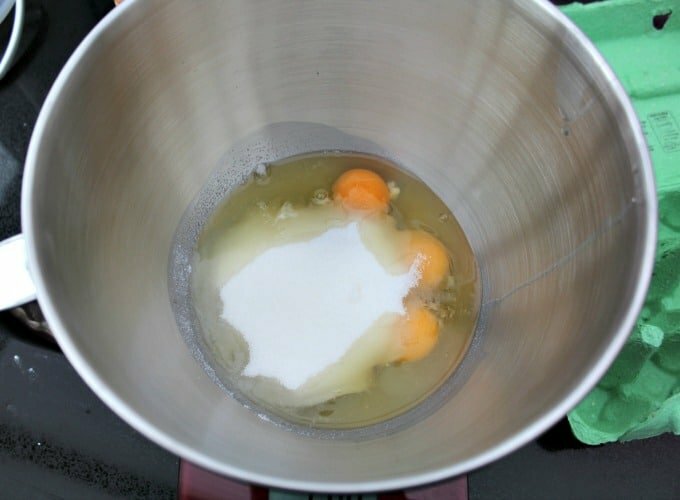 In a large mixing bowl, add the sugar and eggs, beat of a medium speed until tripled in volume, see photo. This will take around 7-8 minutes. 4. In a separate bowl, sieve the flour, salt, cornstarch and cocoa powder. Then add to the egg batter. Add the melted butter and using a spatula or large spoon, gently fold the mixture until combined. *** Do not over mix! 5. 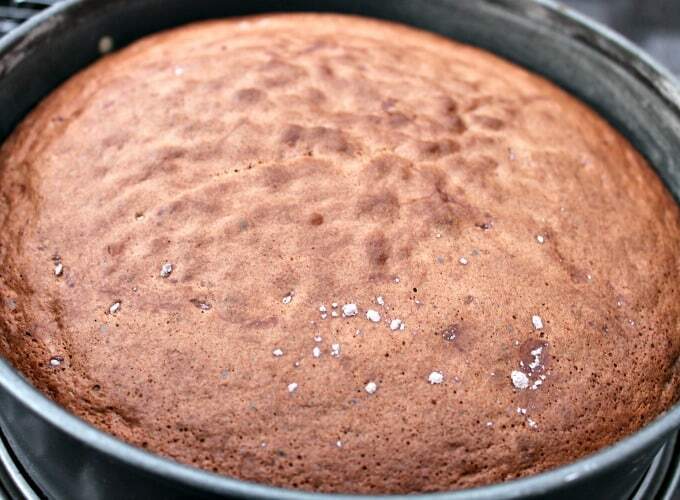 Transfer to your greased and floured cake pan and place in oven for about 40 minutes. Test the center with a skewer to make sure the cake is done. 6. 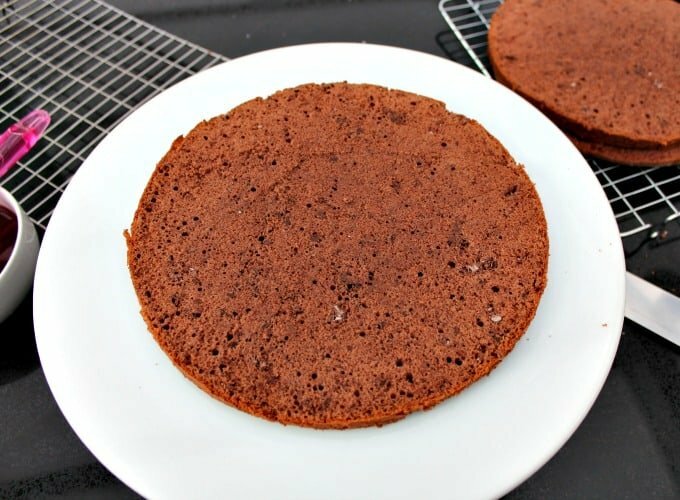 Transfer the cake IN the pan on to a cooling rack and let rest for 15 minutes then carefully turn out from the pan, upside down on to a cooling rack and leave until completely cooled. 7. 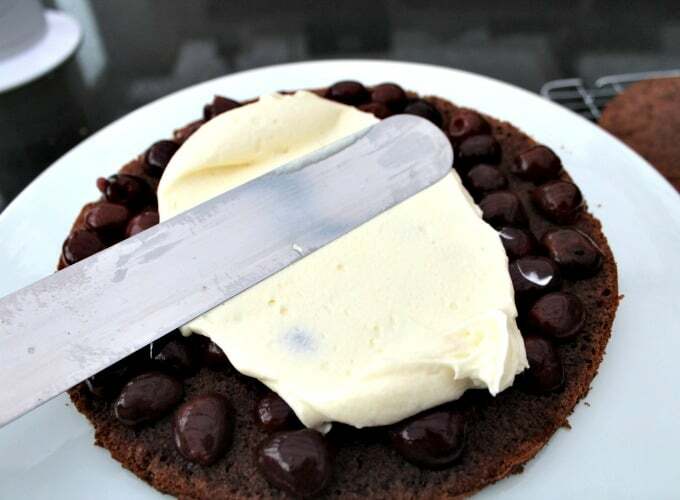 Using a serrated (like a bread knife), slice the cake into 3 equal layers as the photo. and set aside. 9. 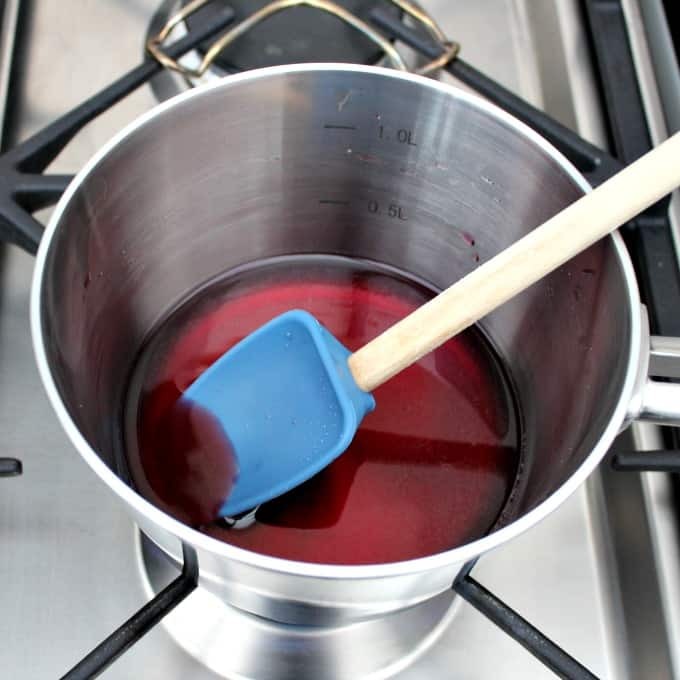 Place the 1/2 cup of sugar and 1/2 cup reserved cherry juice in a medium-size saucepan and under a medium heat, stir until the sugar dissolves. Set aside. 10. Add the liquid used for soaking the cherries in the cherry syrup. Place the cherries on a plate and sort through them to pick a dozen or so nice ones for decorating the top of the cake if you’re not using fresh cherries for the decoration, and divide into 2 equal portions. 11. 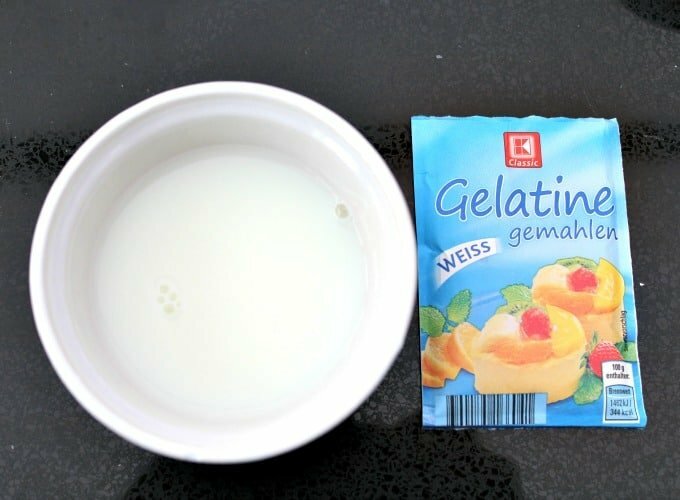 Use a small bowl and add the gelatin and 6 Tbsp milk. Stir. and let sit for 5 minutes. The mixture will get thick. 13. Transfer the gelatin mix to a large bowl and set aside. 14. 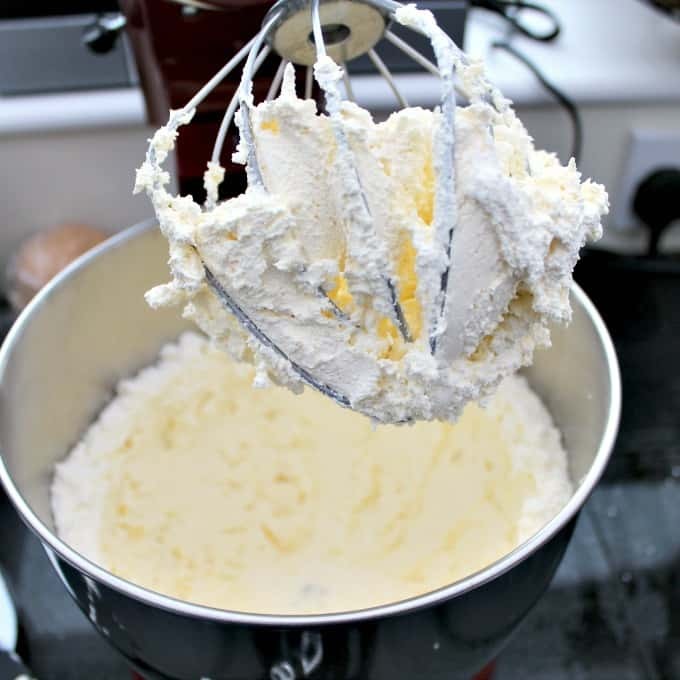 Using a mixer, add the fresh cream, kirsch and vanilla extract. 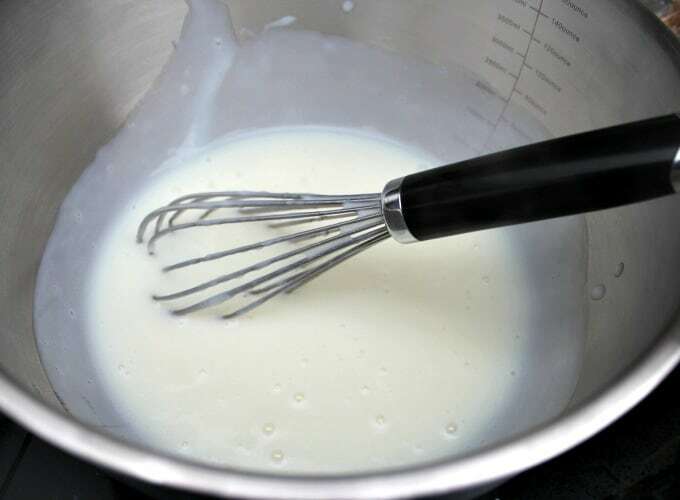 Using the whisk attachment, whisk until stiff peaks form. 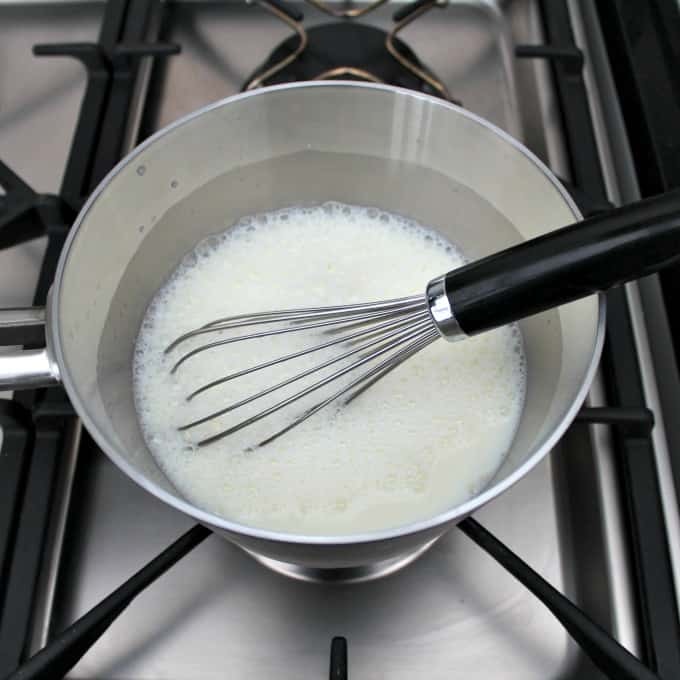 Be careful not to over whisk as your cream will become too stiff and resemble butter! 15. 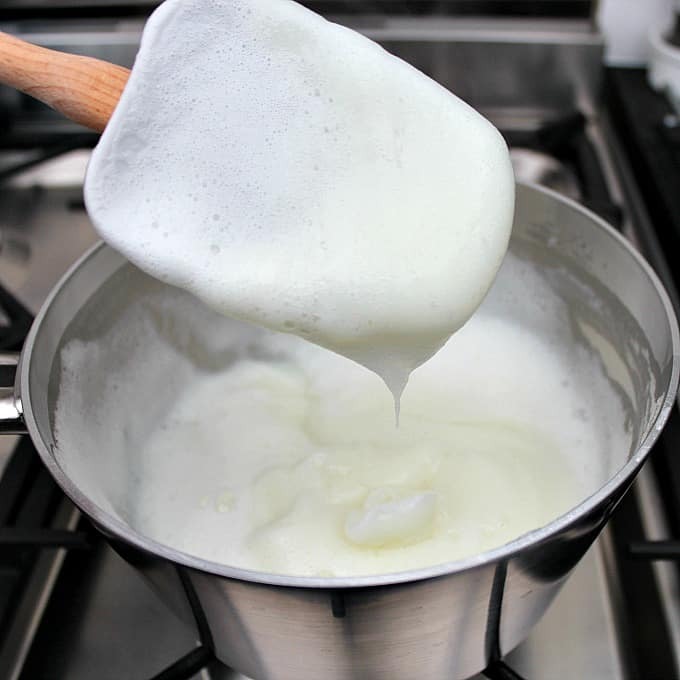 Add half of the whipped cream to the gelatin mixture; stir until smooth using a spatula. 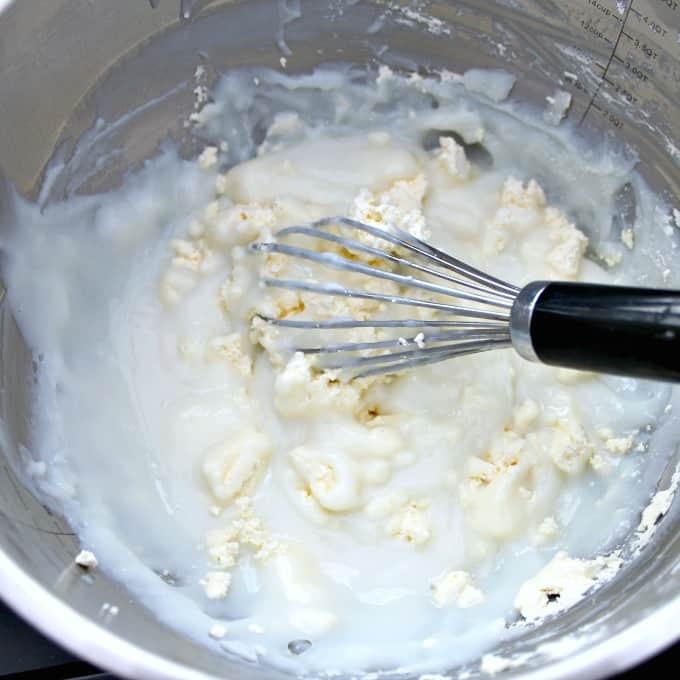 Add remaining whipped cream, and gently fold until the mixture is combined. 16. 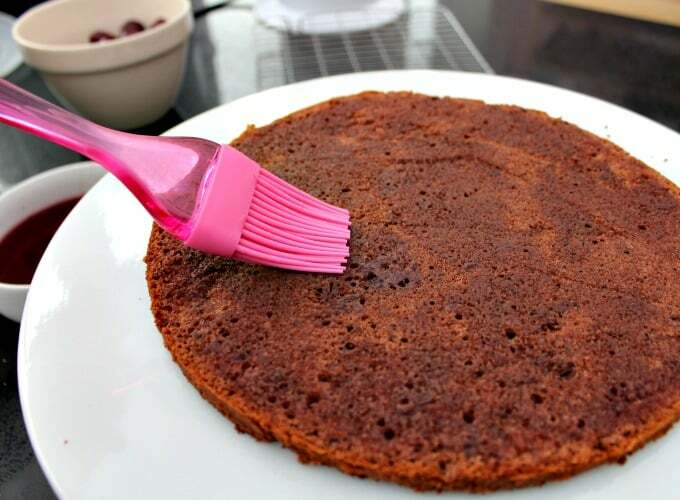 Start by placing the first layer of your cake on a plate and brush generously with the cherry syrup. Brush all over the surface and right up to the edges. 17. 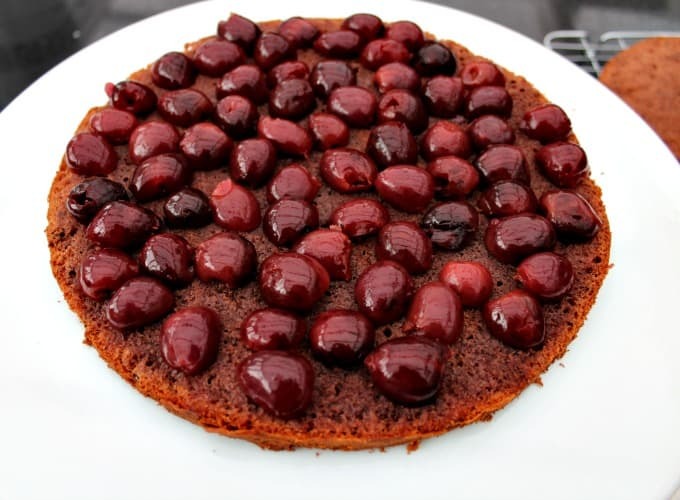 Arrange the first half of the cherries all over the first cake layer. (I cut my cherries in half but you can leave yours whole if you wish). Then take a spatula and spread 1/4 of your frosting mixture all over the cherries. 18. 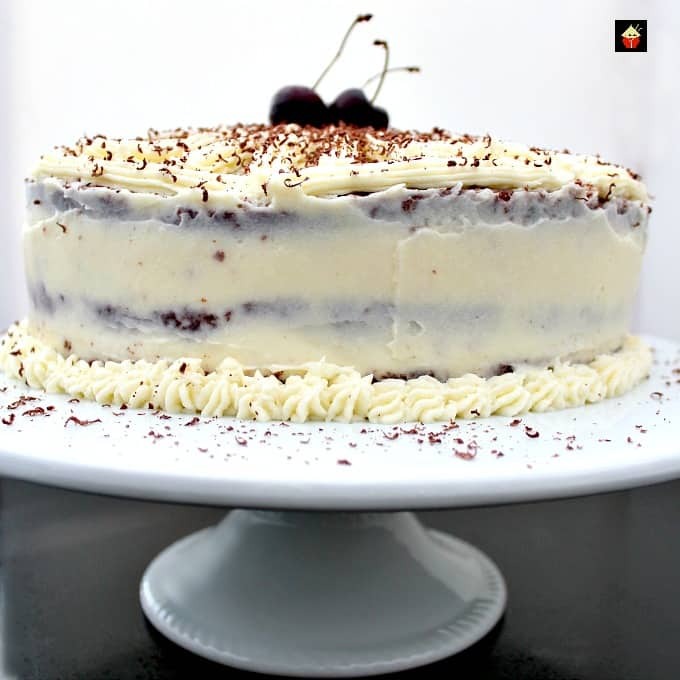 Carefully place the next cake layer on top of the frosting and repeat by brushing cherry syrup all over the surface, adding the second half of your soaked cherries and another 1/4 of your frosting mixture. Finish off by adding the third cake layer. 19. Brush more cherry syrup on the top cake layer, again, be generous, and make sure you reach the edges too with the syrup! 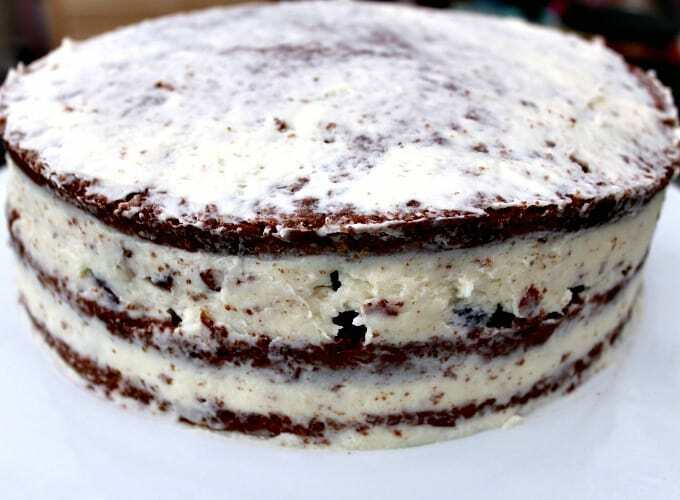 Crumb coat the entire cake with a thin layer of frosting and place in the fridge for 30 minutes to firm up. 20. Remove from the fridge and spread the remaining frosting all over the cake. 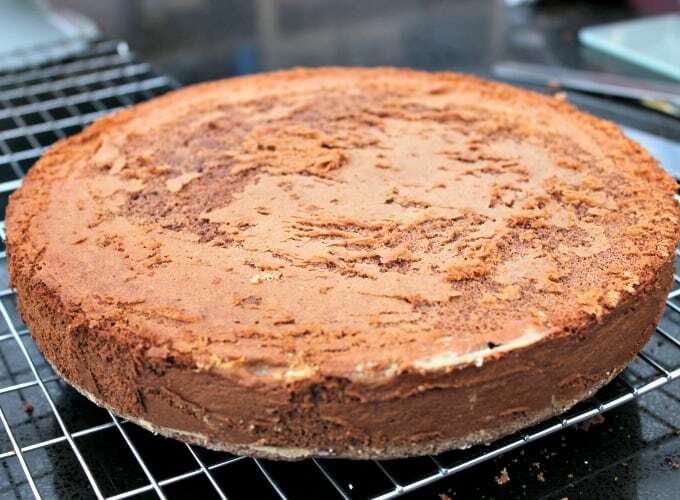 Feel free to spread with a palette knife, use a piping nozzle or simply spread the frosting ‘roughly’. Finish off by decorating the top with the reserved cherries and a grating of chocolate. Place in the fridge for minimum 2 hours, then cut into 12 slices and enjoy! Here are a few more delicious Cakes for you to enjoy! Pre heat oven to 350 F, 180 C.
Grease and flour a deep 9 inch round baking pan. In a large mixing bowl, add the sugar and eggs, beat of a medium speed until tripled in volume, see photo. This will take around 7-8 minutes. 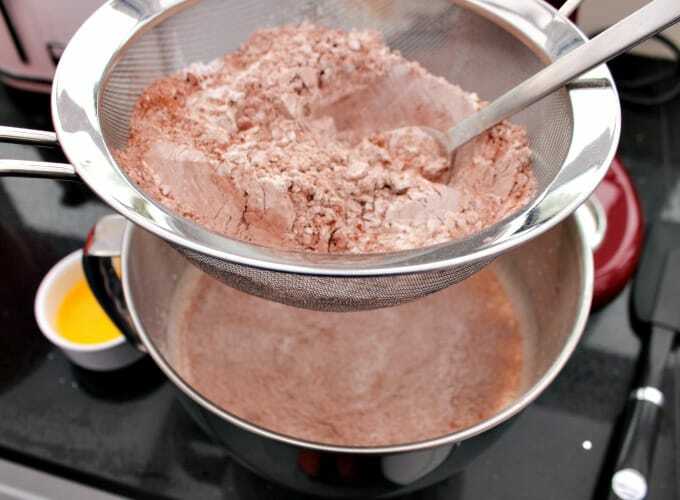 In a separate bowl, sieve the flour, salt, cornstarch and cocoa powder. Then add to the egg batter. 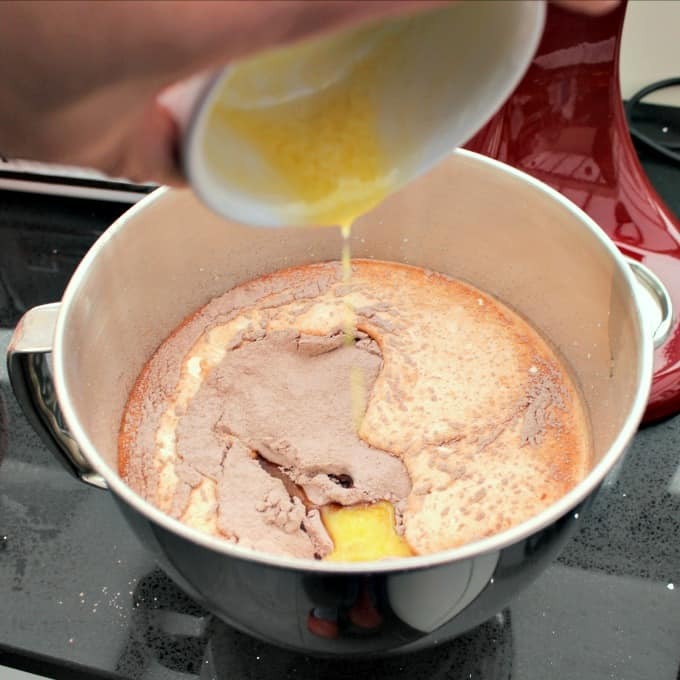 Add the melted butter and using a spatula or large spoon, gently fold the mixture until combined. *** Do not over mix! 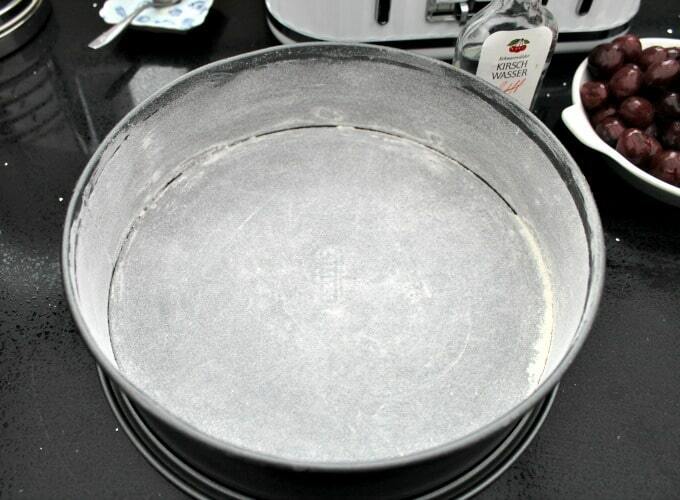 Transfer to your greased and floured cake pan and place in oven for about 40 minutes. Test the center with a skewer to make sure the cake is done. 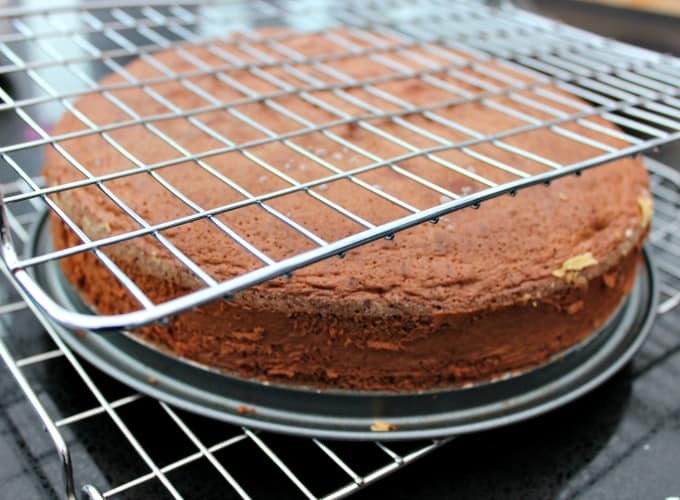 Transfer the cake IN the pan on to a cooling rack and let rest for 15 minutes then carefully turn out from the pan, upside down on to a cooling rack and leave until completely cooled. 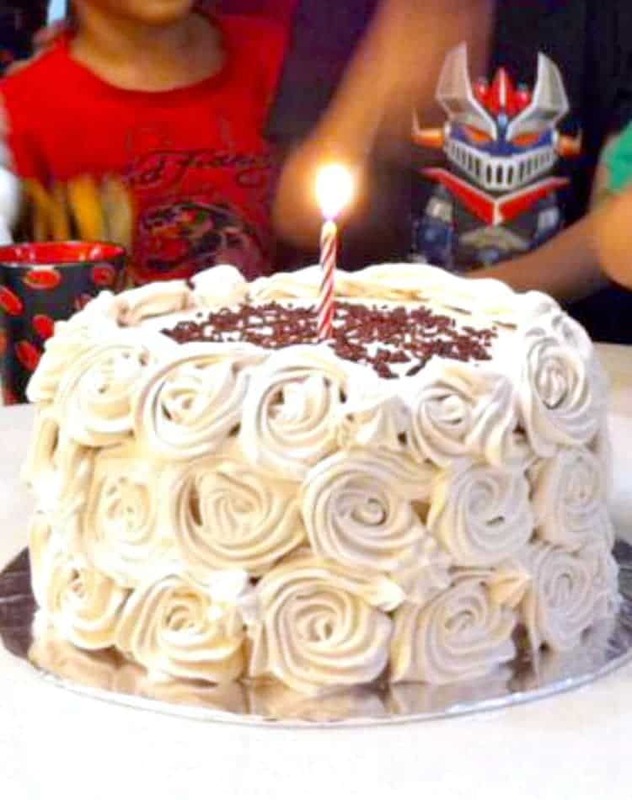 Using a serrated (like a bread knife), slice the cake into 3 equal layers as the photo. and set aside. 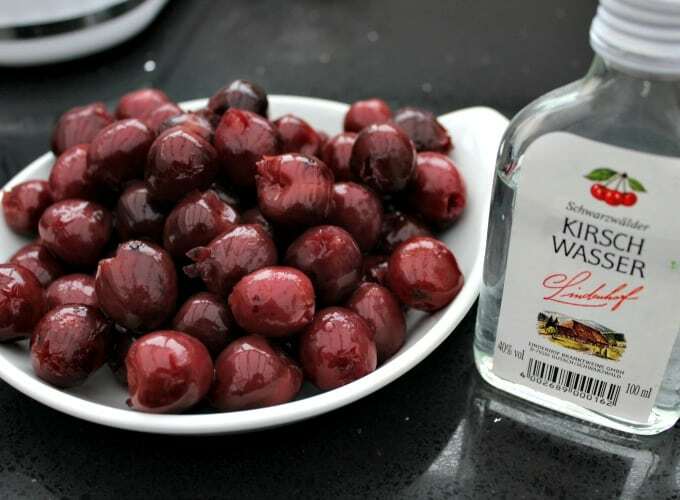 Add the drained cherries to a bowl and pour the kirsch all over the cherries and let steep for about 30 minutes. 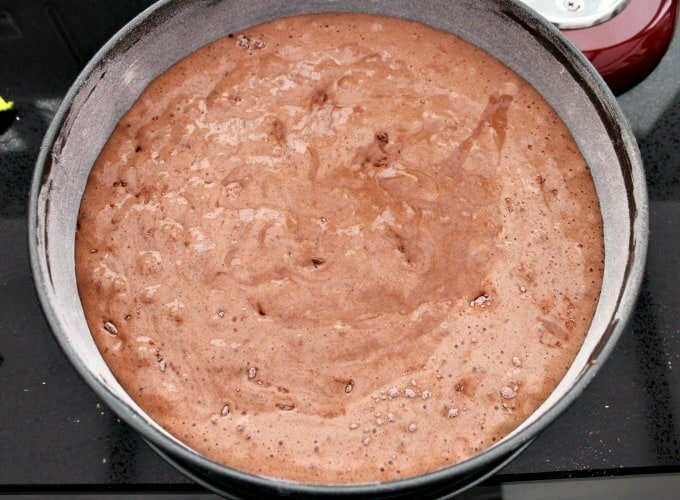 Place the 1/2 cup of sugar and 1/2 cup reserved cherry juice in a medium size saucepan and under a medium heat, stir until the sugar dissolves. Set aside. 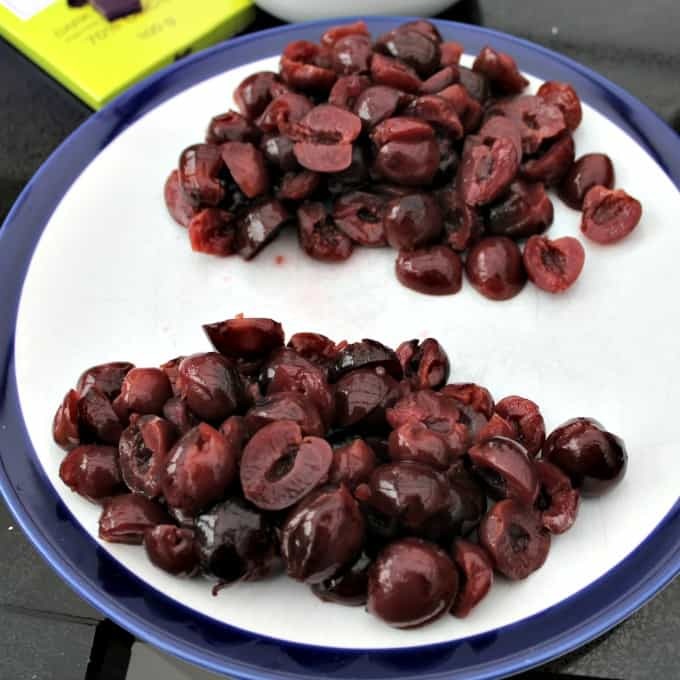 Place the cherries on a plate and sort through them to pick a dozen or so nice ones for decorating the top of the cake if you're not using fresh cherries for the decoration, and divide into 2 equal portions. 14. 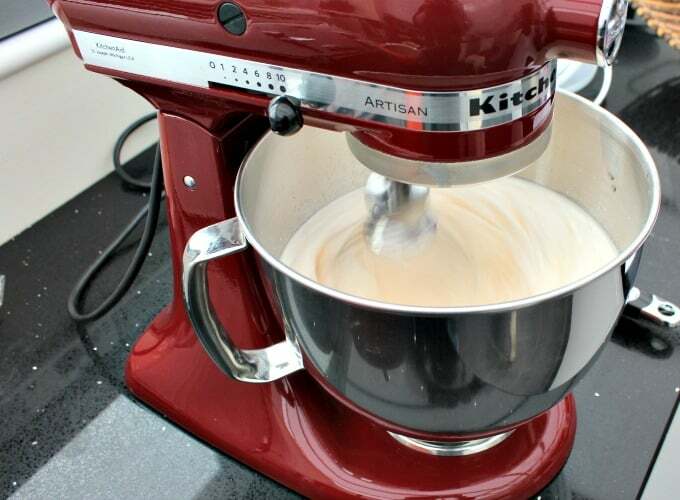 Using a mixer, add the fresh cream, kirsch and vanilla extract. 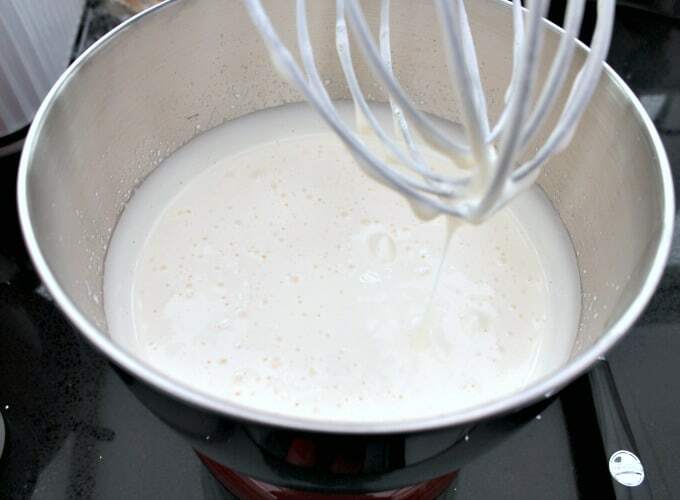 Using the whisk attachment, whisk until stiff peaks form. 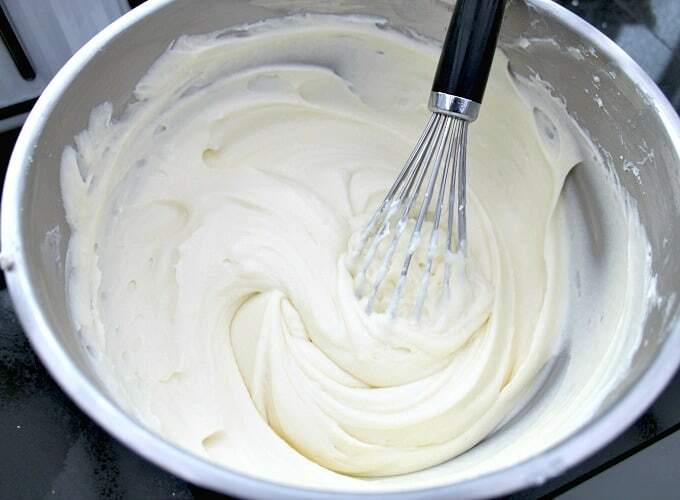 Be careful not to over whisk as your cream will become too stiff and resemble butter! 19. Brush more cherry syrup on the top cake layer, again, be generous, and make sure you reach the edges too with the syrup! 20. 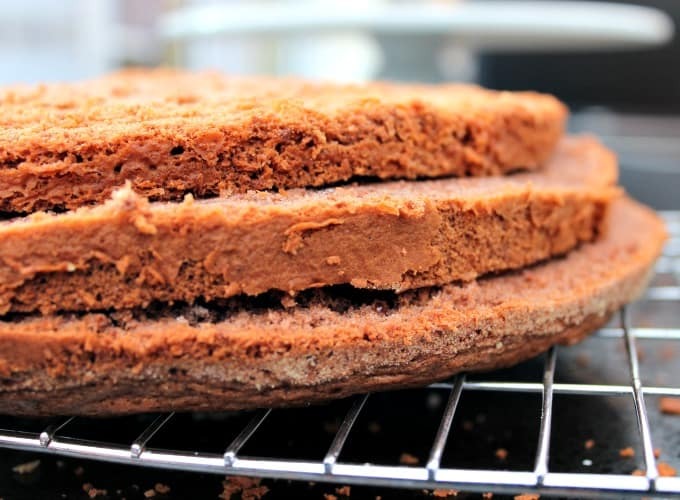 Crumb coat the entire cake with a thin layer of frosting and place in the fridge for 30 minutes to firm up. Then remove from the fridge and spread the remaining frosting all over the cake. Feel free to spread with a palette knife, use a piping nozzle or simply spread the frosting 'roughly'. Finish off by decorating the top with the reserved cherries and a grating of chocolate. Place in the fridge for minimum 2 hours, then cut into 12 slices and enjoy! 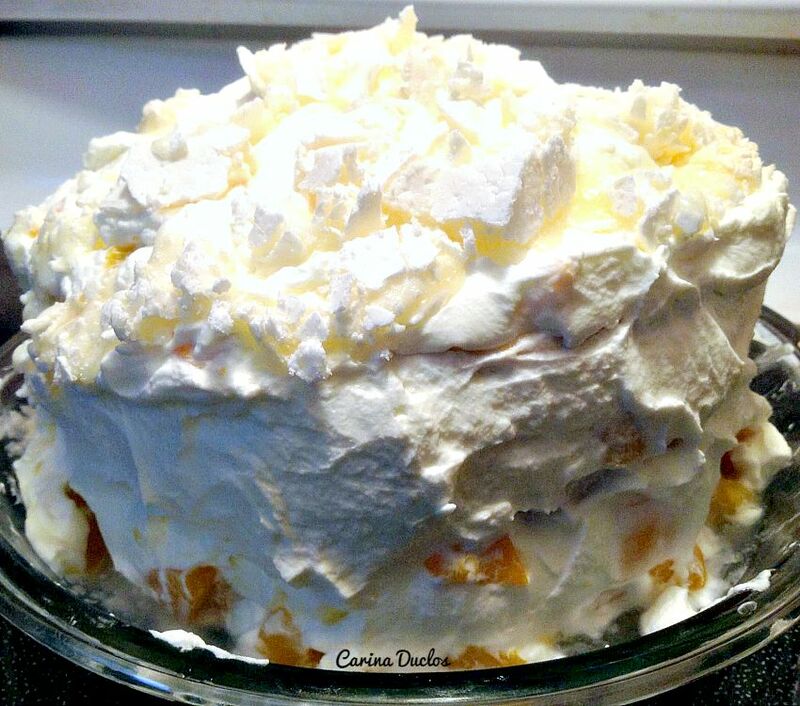 I’m making this for a Dutch/German friend’s birthday this weekend! So glad I found your recipe; I looked at about 4 others but this one looks the most promising! Thanks! Most delicious cake ever! Everyone loved it! I loved that it isn’t too sweet & you can actually taste the cherries & liquor! Thanks for sharing! Hey Agathi! I was wondering how you got on making the cake. So glad you enjoyed it!! Is the cake portion missing a leavening agent like baking powder or baking soda. My cake never rose. I followed the instructions very precisely. I found this too, maybe use self-rising flour rather than plain? 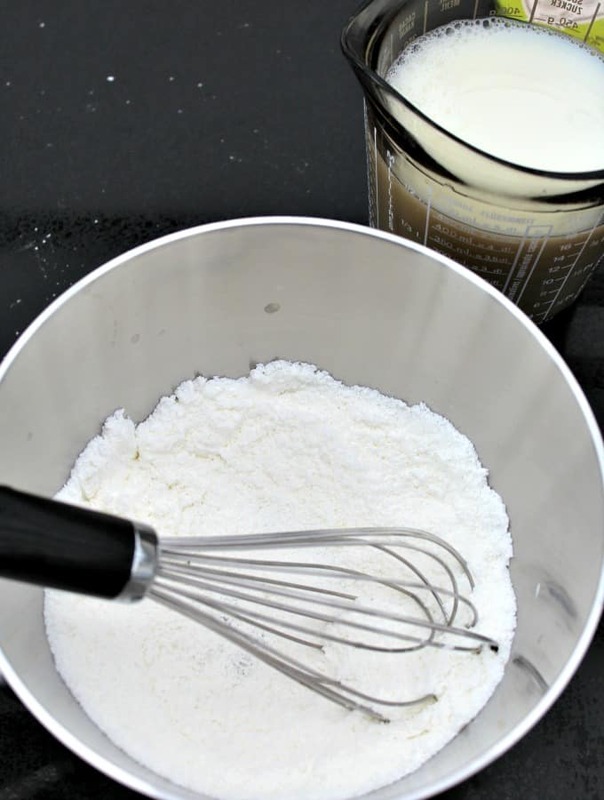 Hi, this recipe uses the eggs as the raising agent, you must beat the eggs and sugar until there is a lot of air and once the volume has increased, you need to very carefully fold in the flour so you don’t knock all the air out. That way, the sponge will be very light and should rise in the oven. My cake never comes out tall enough to cut into three layers. I think I’m following the instructions to the letter. Can you explain the step where you add the dry ingredients and the butter? Do you stir the dry in first? Do you put the dry in and the butter and mix it all at the same time? Hi Bea, yes the gelatin is a stabiliser, and firms the whipped cream. Without it, the cream would turn watery after a while so this keeps it set better. It will be fine at room temperature for a couple of hours, and before that, just refrigerate it. The frosting is quite firm and isn’t anything like buttercream, it’s much lighter in taste. Please enjoy! Wow! What a beautiful and delicious cake! I have found the cherry liqueur but it’s red. It’s written kirsch. I have tried the authentic in Germany as I have also had a Black Forest cake also and it’s so so delicious. I’m not sure If my cake will come out ok with the red kirsch cherry liqueur ? Can’t find the authentic. Planning to do this on my husbands birthday. Thank you. 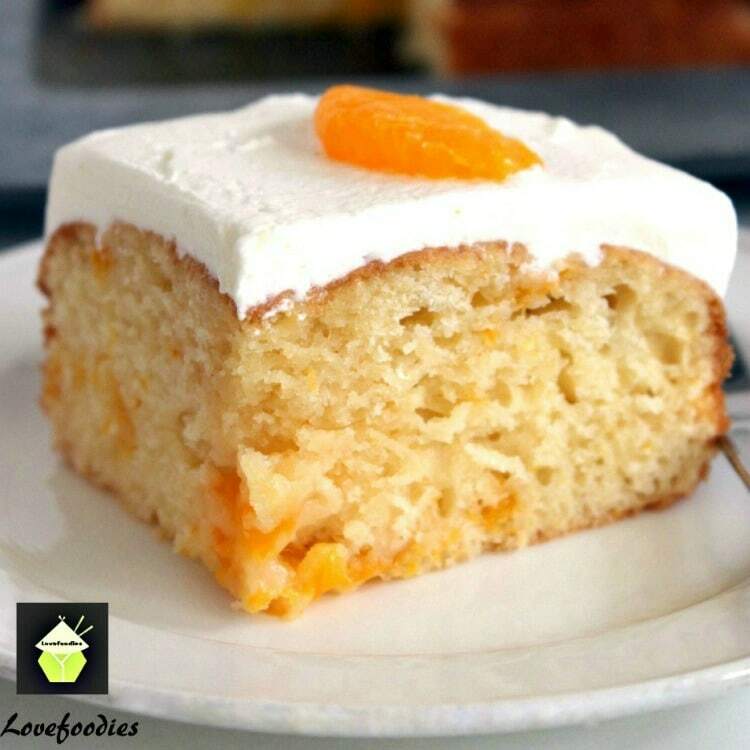 Hi Agathi, glad you found the recipe! It really is so delicious! I think it will be ok with the red liqueur, they will have the colouring in so be aware if you decide to add it to the whipped cream it will make it pink! 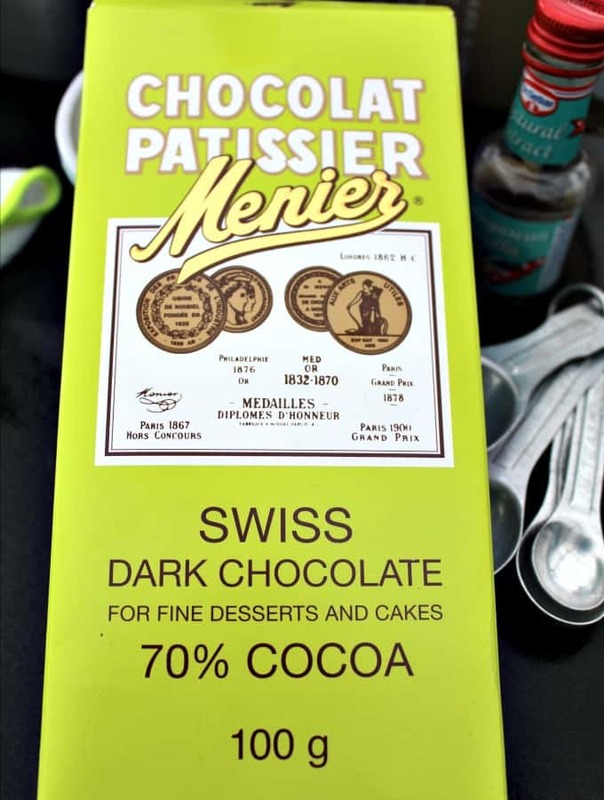 If you taste it, you’ll know if it’s the same flavor as what you had in Germany, but anyway, use it because it won’t harm the recipe! Ok! Thank you! Also would like to ask 9 inch pan depth or width? Sorry doing it today! Very excited! So you know for future reference, when a pan size is stated, it is usually referring to the diameter for round pans, and length for rectangular / square pans. So in this case, the size is 9 inch wide round pan. Whenever depth is required, recipes usually say ‘x inch deep pan, so you know it isn’t a regular shallow pan. Hope that helps you for the future!